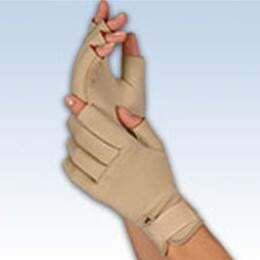 Light compression Arthritis Gloves provide therapeutic warmth to reducepain and swelling. Neoprene material retains the body'snatural heat to provide soothing warmth and long-lasting pain relief toaching wrists, fingers and hands. Soft lining wicksmoisture away to keep hands dry. Ideal for arthritis, aching fingers,hands or wrists, overuse or repetitive use injuries, CarpalTunnel Syndrome, and tendonitis. One pair - fits men or women. Color:Beige.For size measure around hand at knuckles.